Emily wasn’t planning to sell her small software company — until a competitor approached her with what sounded like a once-in-a-lifetime offer. Tempted to say “yes” on the spot, Emily instead contacted a mergers and acquisitions (M&A) specialist. That was a smart move. Although unsolicited acquisition offers are fairly common — and some represent excellent opportunities — caution is warranted. Anyone might approach you, and if your company isn’t already on the market, you probably aren’t in the position to screen buyers or evaluate offers. An M&A advisor can help you determine whether a bidder is serious and whether selling now is in your best interest. Unless you understand your company’s value in the current market, you can’t possibly decide whether a bid is fair. Your advisor will appraise your business, which includes reviewing its financial statements, assets and intellectual property and researching recent sales of similar companies in your industry. It’s also important to know your bidder’s acquisition strategy. Does the buyer operate strategically and pursue only those companies that offer cost synergies and whose products and services complement its own? This type of buyer is more likely to pay a higher-than-market rate for an acquisition it really wants. Or is the bidder interested in buying your company as cheaply as possible so it can resell it in a couple of years? These “financial” buyers are less likely to negotiate on price. To ensure an unsolicited buyer can put its money where its mouth is, your advisor will find out whether it’s well capitalized or overleveraged. If the buyer doesn’t have the cash to make an acquisition, it needs to qualify for bank financing — which can be tough in the current market. Your advisor can also help you screen for fraud and unfair dealing. A buyer might have a history of trying to snap up businesses on the cheap or through hostile bids, or it may be known for not honoring preliminary agreements. It’s usually best to walk away from such buyers. Nothing puts a crimp in a business’s cash flow like slow- (and no-) paying customers. You say you expect your customers to pay on time and in full. But you may be giving off mixed signals if your billing and collection policies aren’t clear and consistent and you don’t seriously pursue deadbeat customers. The quality of your products or services, and the efficiency of order fulfillment and distribution processes, can significantly impact your ability to collect. You give customers an excuse not to pay when an order arrives damaged, late or not at all, or bills are incorrect. Sending invoices out late can also thwart your collection efforts. Make sure you set your payment schedules according to industry norms (whether they’re on 30-, 45- or 60-day cycles). If your most important or largest clients have their own payment schedules, be sure to set them up in your collection system. If you haven’t already done so, implement an automated collection system that generates invoices when work is complete, flags problem accounts and generates financial reports. Electronic invoicing that enables customers to pay online can help boost collection rates and reduce work for your staff. Despite your best efforts, you’re likely to encounter slow-paying customers. It may make sense to give good customers that are experiencing temporary cash-flow problems some slack by, for example, setting up an installment payment plan. But you need to assume a strict stance with repeat offenders and those you suspect aren’t operating in good faith. Start by assessing fees or finance charges for past-due amounts. If customers are extremely delinquent, put their accounts on credit hold or adjust their payment terms to cash on delivery (COD). If a customer is disputing part of a bill, ask it to pay the portion it’s not disputing while you investigate its claim. Research has shown that the likelihood of collecting an invoice drops from more than 90% after 30 days to just 74% after 90 days. So your receivables department should promptly follow up on late notices, and the manager who works with the customer should talk with his or her contact at the company or the company’s owner. If your in-house efforts don’t work, get help from an attorney or collection agency. Keep in mind, though, that third-party fees may consume much of the collected amount. To reduce the chances that you’ll have to take such drastic measures in the future, screen potential customers rigorously. Review their payment histories and credit scores and verify their bank account information. For higher-risk customers, require full payment upon delivery for their first few orders. Or request an up-front deposit for each order. Here comes retirement … Are you ready? That was fast! It seems like only yesterday you were starting your first job, and now you’re staring down retirement — ready or not. Unfortunately, many Americans near retirement age aren’t ready, not having saved enough to enjoy their post-work years in financial comfort. If you’re unsure about what you have and what you need, now’s the time to look closely at probable retirement income sources and, if necessary, catch up. Real estate (excluding your primary residence). Most retirees need between 70% and 85% of their working income to maintain their current standard of living during retirement. Your needs will be smaller if, for example, you’re planning to move to a less-expensive city but greater if you want to travel the world in luxury. Also consider fast-rising health care costs and whether you hope to leave money to your heirs. If you’re concerned you won’t have enough money to retire, don’t despair. People age 50 and older are allowed to contribute greater annual amounts to tax-advantaged retirement plans to catch up. (See the sidebar “Making up for lost time.”) Slash your current spending budget to the bare bones so you can contribute the maximum amount. Also, if you’d planned to retire at age 65, consider putting it off until age 70. You’ll have a few more years to make retirement plan contributions. Plus, putting off taking Social Security benefits until age 70 will mean larger checks once you do receive them. Another option is to work part-time during retirement for extra income and, possibly, benefits. Those 50 and older generally are allowed to make “catch-up” contributions to their tax-advantaged retirement accounts. If you’re age 50 or older by Dec. 31, 2013, you may contribute as much as $23,000 to a 401(k) plan — $5,500 more than those under 50. IRA contribution limits in 2013 are $6,500 if you’re 50 or older — though your maximum deductible contribution may be less if you or your spouse participates in a 401(k) or other employer-sponsored retirement plan. And if you’re self-employed, you might be eligible to set up a plan that allows you to make even larger contributions. Check with your financial advisor about eligibility. 1. Put it in writing. Draft a simple contract that includes the names of the parties, the amount of the loan and repayment details — such as when term and balloon payments are due. 2. Charge interest. Interest formalizes the loan and prevents tax complications. If you’re making a term loan, charge interest equal to or greater than the current applicable federal rate (updated monthly atirs.gov) and report any interest you receive as income on your tax return. When making a demand loan (for which you can request repayment at any time), seek expert advice, because the tax treatment is trickier. When your goods come rolling in, be sure to document them correctly. You’re probably happy to see couriers delivering inventory items you’ve ordered since it means you can ship to customers, but recording the new stock means yet another repetitive task. QuickBooks’ tools can help with this, but you need to be sure you’re using the right forms. There are two different ones that you’ll use, depending on whether or not you’ve received a bill. Figure 1: If any purchase orders exist for that vendor in QuickBooks, you’ll see this message. Click Yes. The Open Purchase Orders window will open displaying a list. Select the PO(s) for the items received by placing a checkmark in front of it/them and click OK. Tip: If you accidentally click No, the vendor’s information will be filled in on the Enter Bills screen, and you can click the Select PO icon in the toolbar. Now the PO item information has been entered in the window. Check the form for accuracy, then save it. Of course, if there was no purchase order, you’ll enter the information about the items you received (descriptions, prices, etc.) in the Enter Bills screen. If you receive items without a bill, you still need to document the shipment. Open the Vendorsmenu and select Receive Items (or click the arrow next to the Receive Inventory without Bill). The Create Item Receipts window opens. Select the vendor by clicking the down arrow next to that field. If a message about existing purchase orders for that vendor appears, click Yes or No, and either select the appropriate POs or enter the information about what you received. If the items were already earmarked for a specific customer on the purchase order, theCustomer column will have an entry in it, and there will be a check mark in the Billable column. If there was no purchase order and you’re entering the information, you can complete those two fields manually. Figure 2: If a purchase order was already assigned to a customer and is billable, that information should appear in this window. Enter a reference number if you’d like. 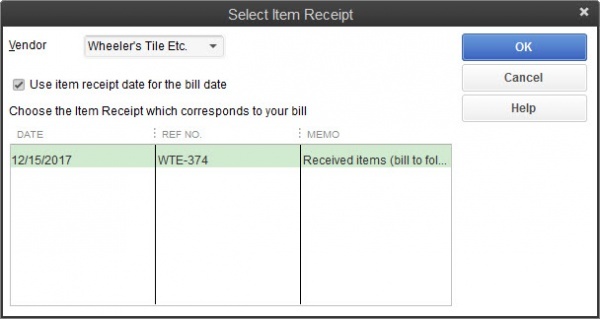 The Memo field should already be filled in withReceived Items (bill to follow), and the Bill Received box should not be checked. Warning: Be sure that the Items tab is highlighted when you’re recording physical inventory. If there are related costs like freight charges or sales tax, click the Expenses tab and enter them there. 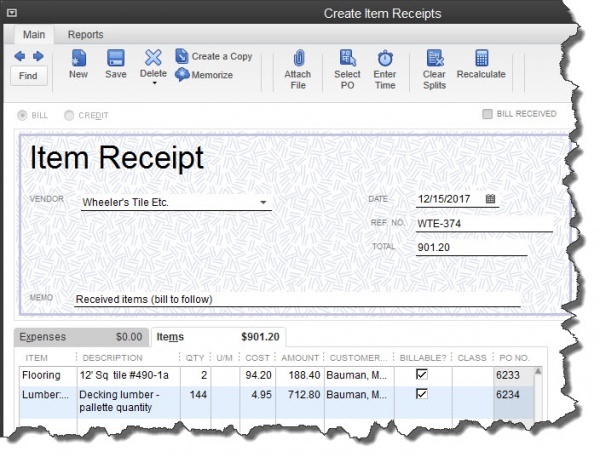 Click Vendors | Enter Bill for Received Items, which opens the Select Item Receiptwindow. Select the vendor, then the correct Item Receipt. Note: If the bill corresponds to more than one Item Receipt, you’ll need to convert each into a bill separately. You can create a new bill if some items received were not accounted for on Item Receipts. Click the box next to Use the item receipt date for the bill date if you want to match it to the inventory availability date. Click OK. The Enter Bills screen opens, which can be processed like you’d handle any bill. Though it may seem like extra work, this last procedure is important, since it prevents you from recording the same inventory items twice. It’s easy to get tangled up on these procedures. We hope you’ll consult us when you being implementing inventory management in QuickBooks, or when you’re taking on a new task there. It’s a lot easier to prevent errors than to go back and fix them.